FlightAware.com has up-to-date flight cancellation info for travelers. Another day, another natural disaster that screws things up for people who don’t even live near the affected area. According to the folks at FlightAware.com, around 1,100 flights in and out of U.S. airports have already been canceled in anticipation of the heavy snowfall expected to coat the Northeast. Not surprisingly, those airports with the most cancellations are almost all located within the storm’s path. 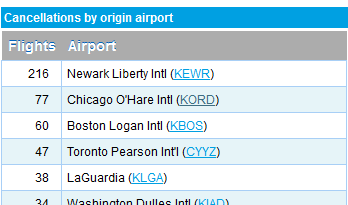 Newark Liberty leads both categories of in- and out-bound flights canceled for Friday with nearly 500 total (as of now). EWR is a high-traffic airport in the storm’s path that also happens to be a major hub, especially for the nation’s largest carrier, United, which has canceled at least 365 flights so far. Other airports with a large number of cancellations — Boston’s Logan Airport (around 150 total), LaGuardia in NYC (130), JFK (97), and O’Hare in Chicago, which has canceled at least 77 outgoing flights for tomorrow thus far. Regional carrier ExpressJet currently has the second-most cancellations with 169, followed by Delta (84), Shuttle America (70), Pinnacle (52) and American (44). These cancellations will have a ripple effect that results in delays and cancellations in parts of the world that are sunny and bright. So if you’re traveling this weekend, regardless of your destination, be sure to keep an eye on your flight so you can plan accordingly.